THIS SHED HAS THE SAME SPECIFICATION AS SHEDS SOLD IN ENGLAND. The above shed is Pressure Treated Shiplap Shed has been designed to give you a quality Shed at a Budget Price. Garden Sheds Direct can also supply with a Base Coat finish. The Apex Roof give extra Height and the Window can be fitted either side. It’s a stylish Shed which offers excellent Storage Space. 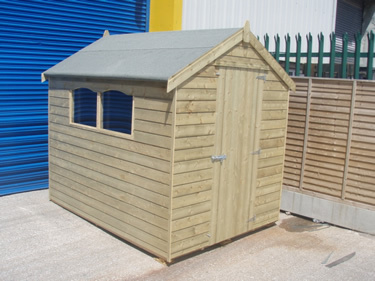 This Budget Priced Shed is also available in Base Coated finish. Onduline Sheeting is available.